MBS have continued to perform poorly last week. 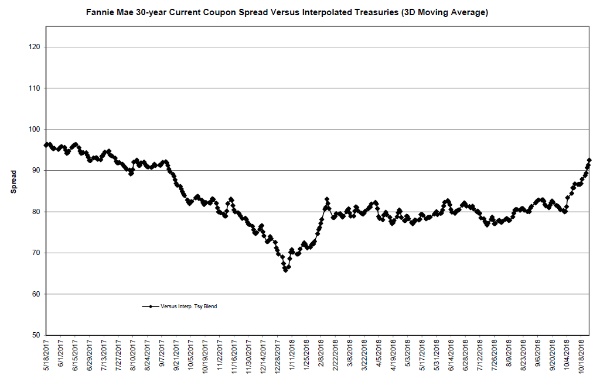 The 30-year current coupon spread over 5-10 year interpolated Treasuries widened to +94 basis points; as indicated by the accompanying chart, this represents the widest level for the spread in over a year. (At the beginning of October, the spread was around +80.) 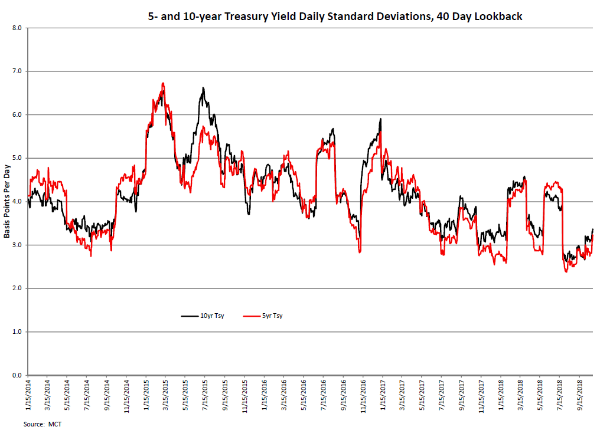 Click to Enlarge The widening was due in part to the uptick in market volatility, but realized Treasury volatility remains well below where it was last summer; as the chart below indicates, the daily standard deviation (using a 40-day lookback) for the 5- and 10-year Treasury remains more than a half-basis point lower than it was in late July, when the current coupon spread was below +80. The MBS widening was probably due more to the heightened uncertainty and poor tone in the equity markets than the uptick in Treasury market volatility, even though interest rate volatility is more directly linked to MBS valuations. Click to Enlarge Despite the small respite in rates, the note rates of locks in mortgage pipelines continues to move higher. 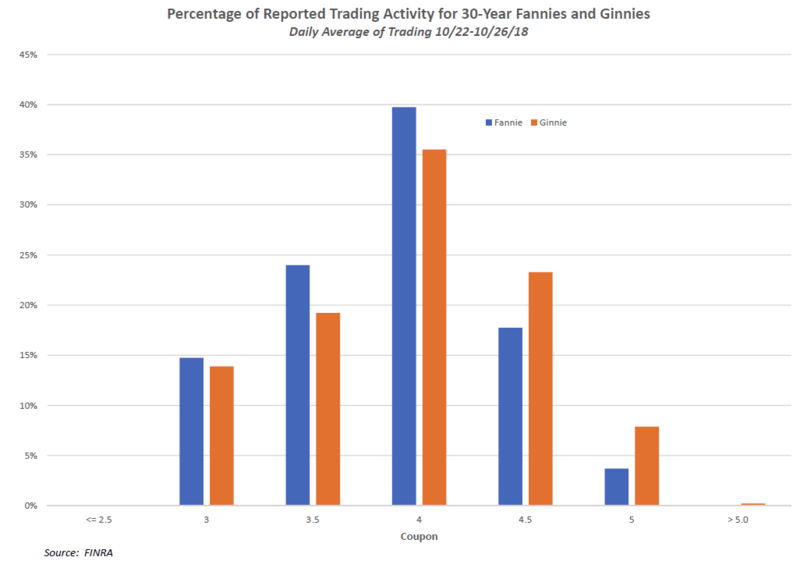 Using MCT’s client pipeline data and fairly standard slotting metrics, we estimate that around 45% of conventional 30-year locks will slot into Fannie or Freddie 4.5s and another 40% will be securitized into conventional 4s, with 5s comprising the bulk of the remainder (around 12%). 30-year government pipelines are even more heavily skewed toward higher coupons; 46% of these locks would slot into GNII 4.5s, and roughly 25% securitized as GNII 5s. For both conventional and government programs, very few locks (2% and 3%, respectively) would slot into 3.5% coupons, and virtually no 3s will be produced.